Just in case you missed tickets to the now sold out Triple Door shows on the 28th and 29th, an additional date has been added to the tour schedule – March 30th. Yes, I am tempted to pick up a ticket to see Zoe at the 5th Avenue Theatre in addition to the 29th, but alas, budgetary restrictions abound and, to be honest, I probably need lessons more than inspiration at the moment. 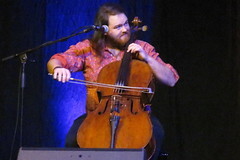 This entry was posted in Cello News and tagged 5th Ave Theatre, concerts, local music, performances, seattle music scene, Triple Door, zoe keating. Bookmark the permalink.